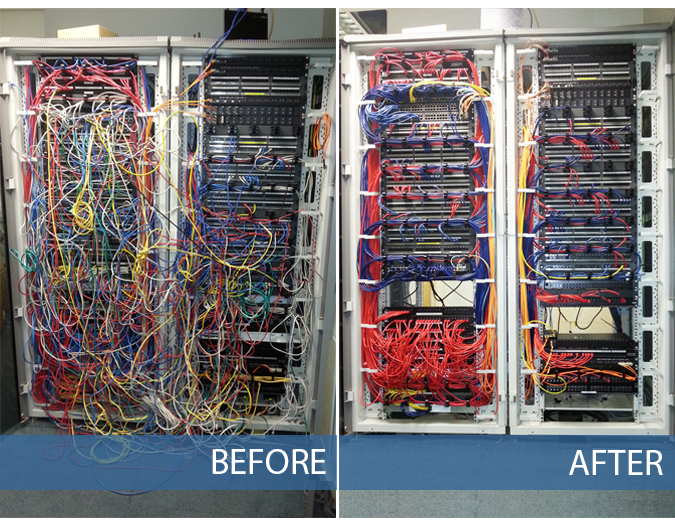 At Total Network Technologies, we understand that over time comms cabinets can become unmanageable. Constant re-patching by different members of staff, with any leads that they may have to hand, just to get network devices patched in and operational can leave a knot of cabling that is very difficult to work with. We provide a complete and tailored cabinet refresh service for our clients in Norfolk, Suffolk and Cambridge, click here for further information or to discuss your requirements in greater detail. We fully appreciate that the reorganisation of voice and data patching in cabinets can be a huge disruption to your network – so we’re happy to undertake any project outside of normal working hours to minimise any interruption to your day to day business. Extensive documentation of patching prior to removal/replacement of existing patch leads. Relocation of patch panels (if required/feasible) to logical locations within the comms cabinets. Installation of cable management bars (if required/feasible) between patch panel and switches. If required, the structured cabling can be tested to the relevant standards at this point. Re-patching of required ports with colour coded, correct length patch leads to easily identify how ports are being utilised. Testing of devices re-patched to confirm that all network devices and telephones are operational.